So, who better to celebrate the anniversary with? Let me introduce you to my beautiful bird buddies. Let's start this post off great, with another one of my favorite photos I've ever taken. I think it is very important for me to realize that my "favorite photos I've ever taken" continue to increase lately. It means I'm learning and improving, and you should NEVER stop learning or striving to improve! 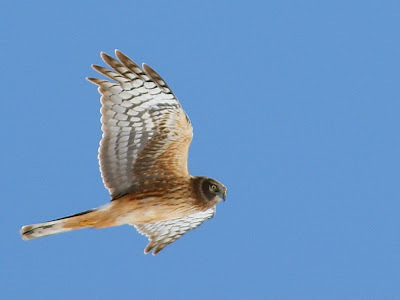 This is a Northern Harrier, in all her glory. Seriously, can you possibly look at this and say it's not beautiful? I think she's planning on trying to take my head off again! *Sigh* These are the birds who have a conspiracy against me. 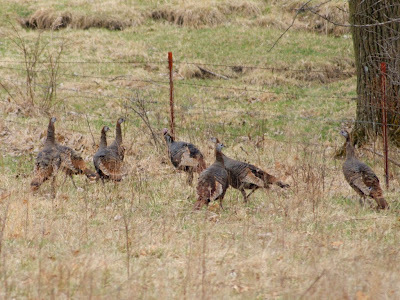 These are, obviously, some turkeys. right as it was beginning to sleet. Crazy Little Lady with Big Camera away! *Sigh* My Grandma would love this photo. She loved birds, especially Cardinals. The male Cardinal kept chasing the females away from the feeder. So, this female was appreciating the seed I had scattered on the ground. Take that Mr. Really Rude Redbird! here we have a Blue Jay. they were bad birds, because they cause problems for the other birds. They certainly are pretty though, aren't they? Dear Bad Bullying Blue Jay - it you weren't so pretty, I'd give you a lecture! have been frequenting my pond. Thanks, Pals! See that long beaked bird in the background??? Look closely... ya see it? That's a Common SNIPE! Yep, they really DO exist! and it wouldn't even be a joke! your blog is for the birds! 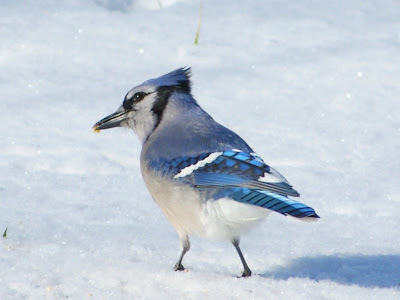 i really love the blue jay! great shots!! That's quite a collection of birds for today!! Beautiful photos. We see turkeys along the toll road all the time. One of these days I am going to stop and take pics... that and an armadillo, before I leave Florida My daughter always gets embarrased when I stop the car to take pics! Beautiful pics! Loved the aerial shots of the hawks! Wow, beautiful bird pictures, thanks for sharing! What a great way to celebrate an anniversary, Mist. Bee-YOU-ti-FUL!!! Ya know.. I've really noticed how much your photography has improved over the last year. Keep on learning.. I can only imagine where you'll take this wonderful talent you have! REAL snipes? Now that is serious stuff! Very nice birdies. 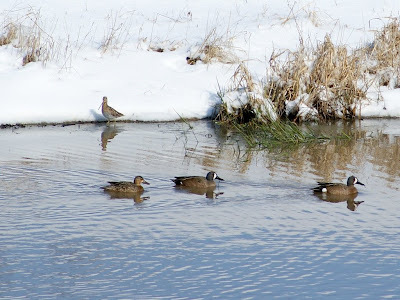 I would have to chase them if they came here, but that first one looks like he might be able to swoop down & scoop me up! wow! I love the way how you capture those gorgeous birds super beautiful. Visit my flamingos here and also the lovely colors of parrots here, thanks and happy one year anniversary. When I was at th lake on Tuesday, I had a couple of birds that almost took my head off as well... in fact, I had to duck !! Once again...Happy Anniversery and congratulations on such a wonderful site!!! I love the in flight shots but then again the sweet little guys on the snow are so adorable! Our fav is the redbird! Wonderful birds, Misty. A big congratulations on one year! Here's to many more! Happy Aniversary to you and thank you for starting this meme for us. Wow, all wonderful photographs of these very beautiful birds. All should be enlarged to get the full benefit of them, they are gorgeous and you have captured that Red-Tailed Hawk perfectly. You actually see that look in his eye. Great post Misty, and congratulations on the One Year Anniversary. You know how much I LOVE that first shot!!! IT'S FREAKING AMAZING!!! awesome bird shots, congratulations on the first anniversary! Beautiful, beautiful bird shots. I like the hawks best, but they're all exceptional photos. Happy anniversary to camera critters. It's a fun blog that I enjoy very much. Congratulations, Misty Dawn! I like all your birds and the colourful cardinal is my favourite! Thanks for sharing! A wonderful series on the birds, Misty. Thanks so much for starting Camera Critters so that we can enjoy sharing the images of pets and wildlife. Gorgeous photos! The birds are beautiful! Happy Anniversary! Great shots, Misty...and congratulations on one year of Camera Critters. They are all beautiful, but I like the cardinal the best. You got some great bird shots, one of my favorite subjects. 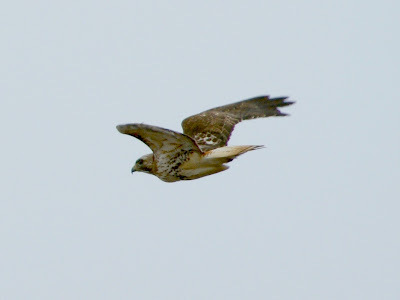 Love all the bird shots, especially the harrier one. Really impressive! Happy Anniversary, Misty! Congrtulations on a year. It's been a hoot, and I've learnt so much as well as enjoyed images such a this. Misty: The year has flown by enjoying all the critters. Here's a poem for you my friend. you may say how does it fly. it comes so fast but I know when. critters I will see a few. a Meme without a lot of fuss. 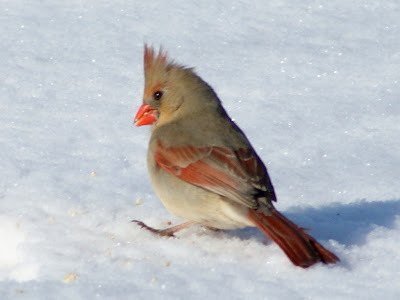 I love your bird buddies, Misty - especially that little cardinal in the sparkly snow. And that Blue Jay's wings are amazing. Happy Anniversary dear Misty! Your bird photos are great! The first one is really a Masterpiece! I also like very much the 4th and 5th ones! Really lovely shots, very anniversary-worthy! Great bird photos. I'm a day late this week for Camera Critters, but it's better late than not at all. Awesome bird pics - I love the in flight pictures!! i agree, blue jays are beautiful bullies.